Kitchen cabinetry is not just for storage. It is an essential element to your kitchen’s style when doing a remodel. Cabinetry is the crown jewel that brings everything together. Cabinet design has not changed much over the last few years; at least not as much as other elements such as countertops or flooring. But here are still a few changes that have happened to kitchen cabinets over time. Today, above anything else, there is a rising trend toward simplicity and minimalism. Here and there however, you will find some wild and bold options popping up. While simple clean cabinetry will keep getting popular, some homeowners will prefer unique customized styles that will make a clear statement. To design the perfect kitchen, it is important to understand what is imperative to you and then incorporate the latest trends around that. 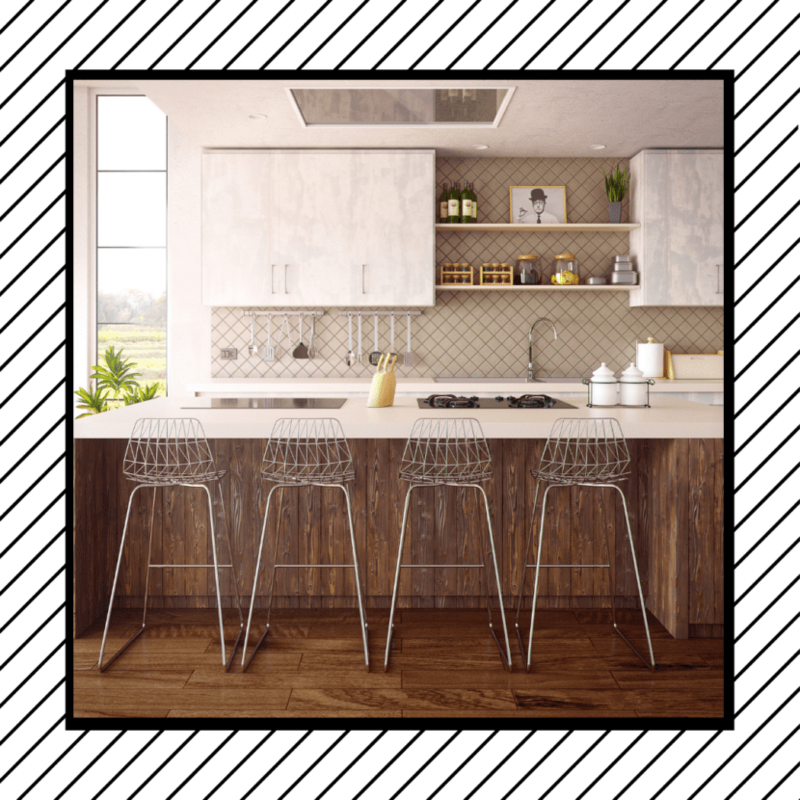 Here are the 4 hottest trends that will dominate kitchen cabinetry design for 2019. Oak wood cabinetry is starting to come back into the kitchen and bathroom marketplace. In the 1970’s and well into the early 90’s, they were the cabinet of choice. Usually seen in a honey spice stain, a version of a raised panel cathedral door with wild grain patterns became the mainstay in many homes at that time. But the popularity of maple, cherry and a rise of engineered wood alternatives reduced the use of oak cabinet constructions. As with other parts of the house, many homeowners are seeking connections to their past and a renewed attention to vintage, with kitchens being no different. The appeal? Neutral color, dimension & texture, and newfound soft luxury that can be layered into any space creating a blended balance. Oak cabinetry is versatile in its look from seaside or French cottage, clean modern simplicity or a common rustic look. Often creating a connection to the natural element. This is why oak, despite its stigma with the past, is becoming more popular option in cabinetry construction. Manufacturers are crafting a variety of interesting door styles–from recessed panels to flat slabs with an inset detail and finishes using oak. You can use oak in its natural color or opt to give it a coat of paint. Shades of blue, & grey seem to be a rising favorite. Kitchen cabinetry has not been spared the modernization wave that has influenced home decor in recent years. One of the most obvious impacts has been the adoption of clean aesthetics in cabinetry constructions. This minimalism trend is likely to continue into 2019 and beyond. Modern cabinets are free of the intricate design work often found in traditional cabinet door styles. They feature a recessed panel door with smooth edge profiles and simple clean lines offering only the simplest of design elements. Even the handles themselves come in low profile styles, not demanding too much attention. Essentially, all the clutter has been pared down to the bare minimum. This type of cabinetry works perfectly with a modern styled kitchen, complementing other components like the countertop and the backsplash. Thanks to technology, homeowners today have an almost endless list of cabinet finish colors and techniques. From warm browns to weathered gray, the choices are mind-boggling. Homeowners are taking advantage of these unique choices. One of the upcoming trends in 2019 involves mixing different finish colors for a completely unique look. You might have the upper cabinets finished in painted white while the base cabinetry is a natural wood look. It is all about creating an interesting design by combining different bits and pieces. One easy way is by making the island a different finish color than the perimeter cabinets. Since the island is more like a piece of furniture, it’s an easy breakaway piece that you can feel comfortable being bold. We are seeing lots of black, navy, and chocolate brown. But don’t just limit yourself to just those options. If you want to take it a step further, you could try mixing two strong colors like black and white. However, this may require neutral colors for the countertop, walls, and flooring. Like with most other areas of the house, homeowners are looking to create personal styles with bold statements. LED lighting has had a particularly good run as homeowners change over from traditional incandescent bulbs. It provides good lighting for activities, comes in a variety of colors and the bulbs last for a really long time. This has made it a popular option for under-cabinet lighting. Under cabinet LED lights come in different forms including pucks, strips, and bars. When fixed under the wall cabinetry, they help add light to the working area as well as improve the overall ambiance. LED is not the only type of lighting that can be fixed under the cabinet. You could opt for fluorescent fixtures, which are almost as energy efficient as LED and produce minimal heat. You could also go with halogen lights, but this is not always a good idea. They give off too much heat which could affect foods or drinks you have stored inside the cabinet. In recent years, cabinetry has undergone more changes than at any other time. A rapid change in tastes combined with advanced technology has given rise to a wide variety of styles. For 2019, the general trend is towards more personalized looks. When it comes to color, finishing, and overall design; homeowners want something unique and personal. If you are building a new home or planning a kitchen renovation in 2019, which trends will you opt for? Looking for more tips and trends? Check out our blog! And be sure to Like us on Facebook and Follow us on Instagram and Pinterest!